Dinosaur Island data structures are complete. 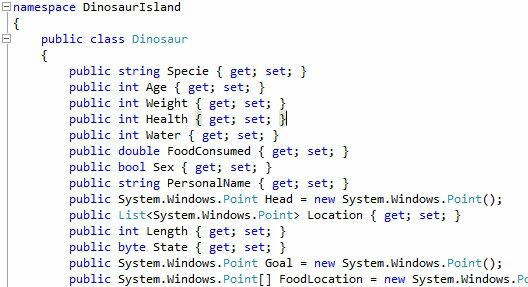 A section of the C# code describing the class of Dinosaurs. Well we passed another milestone today: all the data structures for terrain, elevation, vegetation, plant species, individual plants, dinosaur species and individual dinosaurs are completed as well as all the methods for saving and loading the data and building the island, and its inhabitants in memory are completed and tested. This is one of those milestones where the most exciting picture we can post is a screen capture of a fraction of the source code. Yes, we know, not very interesting at all. However, it’s still a very significant milestone because now we begin working on the artificial intelligence (AI) that controls the dinosaurs. We also have a very interesting surprise for any computer science nerds out there. Here’s a hint: it involves genetics.